Lately I’ve been eating a little cleaner and have gone completely gluten free in an effort to feel better. I’ve always had stomach issues and when I finally cut out gluten I felt so much better. What’s been a little tricky though is cooking for my gluten eating family. I’ve been tweaking recipes to make them gluten free and my family has been gobbling the food up with no complaints! One of the favorites lately is this Almond Crusted Lemon Chicken. 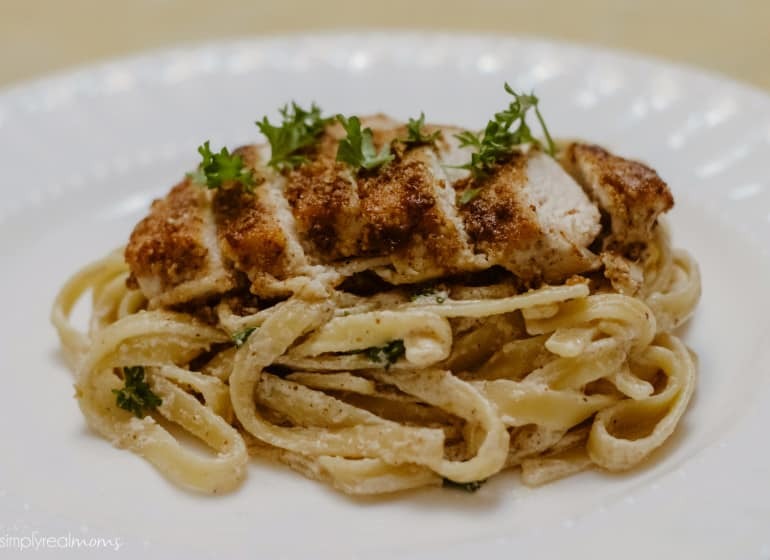 We serve it with a creamy fettuccine (I don’t eat it but you could absolutely make this with GF pasta too!) and a salad or veggie on the side and it’s SUCH a crowd pleaser. The crushed almonds toast up as the chicken cooks and gives this dish a phenomenal taste that I actually prefer it to breaded chicken now. 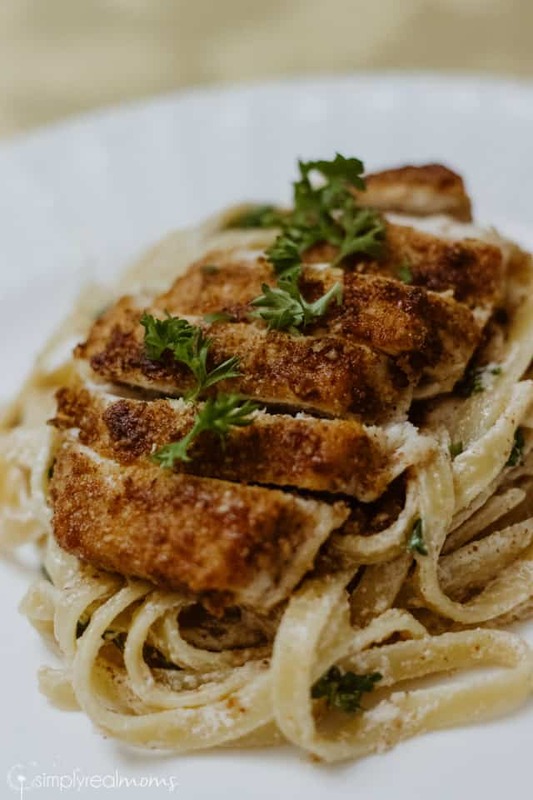 While your pasta is cooking, flatten your chicken breasts using a meat mallet or by placing your chicken into a ziplock bag and using a rolling pin. Flatten to about 1/2 inch thick each, then cut each breast in half. Season with salt and pepper and sprinkle lightly with garlic powder. Place your crushed almonds onto a plate and dip each chicken breast into the almonds, patting down to cover both sides of the chicken. Transfer chicken to the oiled pan & let cook until browned, about 3-4 minutes. Flip chicken and cook the other side until browned. 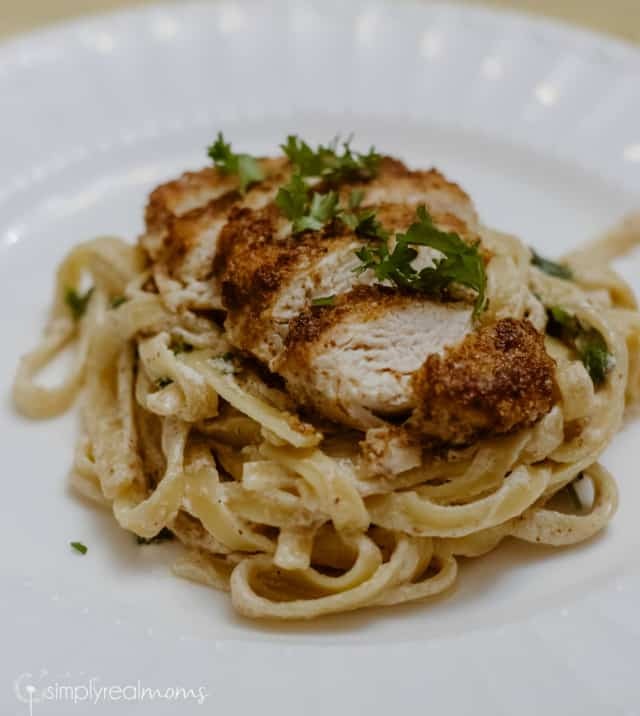 Add lemon juice from one lemon to the pan and let simmer for about 20-30 seconds, flip chicken to let lemon juice coat the other side and transfer chicken to a plate. Add the rest of the lemon juice to the pan, along with the butter and let simmer until the butter melts. Whisk in the half & half until it’s all combined and add in the fettuccine. Toss all with the fresh parsley and serve!